How the kind of external coronagraph developed through StarTiger-2 would work in practice: ESA plans to make Proba-3 the first mission of this kind. A solar eclipse with the moon blocking the sun may lookeerie on Earth, but scientists hope to achieve something similar using twofree-flying satellites, with one always flying in its robotic partner's shadow. The mission would create an artificial eclipse for theobserving satellite and allow a year-round glimpse into the sun's inner corona,which is the super-hot plasma atmosphere wreathing the sun. 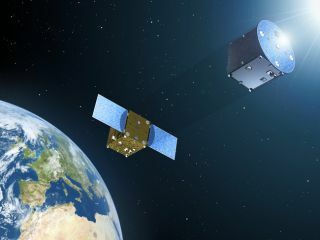 "The idea was to perform relative positioningbetween the two satellites and absolute positioning with respect to the sun,"said Sebastien Vives of LAM, who led the European Space Agency (ESA) researchgroup. Simple coronagraphs typically use a circular disk insidea sensor to block out the direct glare from the sun so that scientists canstudy the fainter areas surrounding the sun's main body. Coronagraphs also helppick out the faintextraterrestrial planets orbiting brighter stars. Rather than rely on a typical coronagraph, the two satellites would fly in tandem with adistance of 492 feet (150 meters) between them. One would carry a coronagraphinstrument to peer at the sun, and the other would act as the'occulter' and try to cast a shadow with a max positioning error ofjust a few millimeters. European researchers unveiled a scale-model of the ideain late April after a six-month huddle at the Laboratoire Astrophysiqued?Marseille (LAM) in southern France. The prototype was built under ESA'sStarTiger research program. Light reflected by a distant mirror helped mimic theplanned operating distance, with a simulated sun, the occulter and thecoronagraph all sitting on an optic bench. The StarTiger coronagraph would use aliquid-crystal-based spectrometer and a 'smart' active pixel sensor detector tocover a wide, changing range of light levels from the sun's corona. "These will help us reach a key science aim, beingable to trace the movement of different high-temperature elements in the coronaat the same time we?re monitoring its fine structure," said Dominic Doyle,an optical engineer at ESA?s Optics Laboratory. The effort represented part of ESA's StarTiger initiativethat brings together scientists and engineers, gives them state-of-the-artlabs, and sets a deadline for a targeted breakthrough. Such early labprototypes have allowed the researchers to continue planning for a futuremission that has yet to be determined. One of the biggest challenges would involve having thesatellites to fly precisely together when traveling at several miles per secondthrough space. Photosensors around the coronagraph can help track the shadow'spositioning from the occulter, researchers said. The occulter satellite alsohas an LED light array that permits optical tracking of its target. All that effort goes toward maintaining the sustained butprecise shadow on the coronagraph. ESA officials concede there are still some major hurdlesfacing a formation-flying mission like the StarTiger coronagraph. But theagency has plans to push the technology forward. Europe's upcoming Proba 3 mission is expected to be firstand foremost a demonstration of the ability for satellites to fly in formation.Even the coronagraph's images would reveal deviations in the tandem-flyingsatellites, and so help check that both spacecraft are flying correctly.